Easter is coming!!! Isn't it fun? Have you planned anything for the joyful day? Perhaps ask the kids to decorate eggs, hide them and get them to find and collect them in their Easter basket? Modern Easter baskets don't need to be actual baskets, though. What about personalizing them to the specific child who owns it? We've found some blogs that made these personalized Easter buckets with colorful plastic buckets. Look at their creative, bright-fun-looking buckets here. Amy has 4 boys. At special times like Easter, she'd want her kids to enjoy the festivity with nice props. 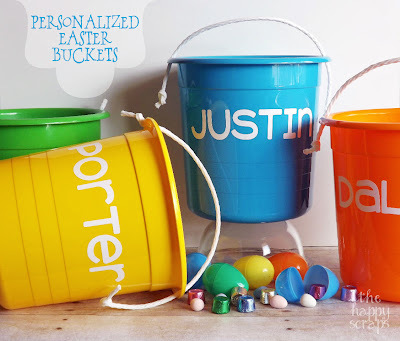 So she came up with this easy idea of getting colorful plastic buckets and put her boys' names in each of them. Click her blog to find out how she did it. Imperfectly Beautiful blog has a similar idea, but only using metal buckets, which look just as grand. She added large dots to pop the design and voila... charming Easter buckets for the kids! Busybeehm blog gets creative with another type of container; i.e. paint cans. Yes, the very paint cans, why not? They look so attractive after some paint, cheerful stickers and colorful ribbons. See below, you know what I'm talking about. Aren't they sweet? What are you going to do for Easter? Share if you have different ideas.